Synovitis. In synovitis the synovial membrane stretches and the synovial villi are entrapped. Friction of the affected cartilage. Reflex irradiation of pain in the knee in coxitis. Decreased sensivity to physical /mechanical load. Fibrosis of the synovium and the articular capsule. Inflammation in and around a joint. 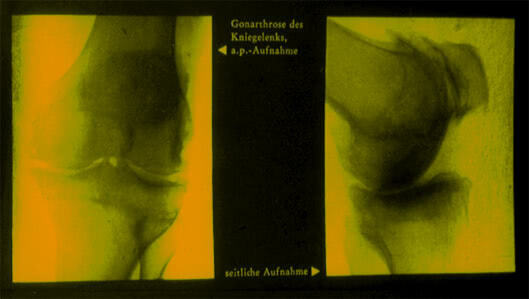 Passive hyperemia of the subchondral area. 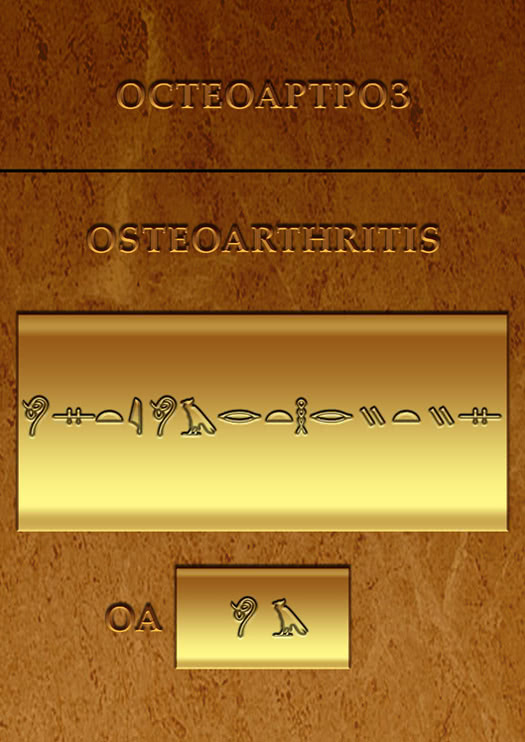 Formation of osteophytes, which cause blockade. The first two clinical and radiographic criteria must be present to make a diagnosis of osteoarthrosis. Differentiation of Osteoarthritis from Other Diseases. Imaging studies of the affected joint are usually conducted in the elderly who may not have any other clinical features. For making a final diagnosis we cannot rely only on imaging or laboratory findings. A comprehensive analysis of clinical manifestations and some additional studies may be necessary for detecting the causes of pain in joints. 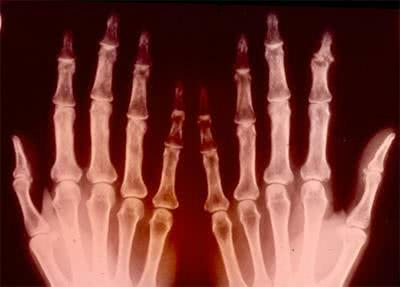 Osteoarthrosis must be differentiated from arthritis of various origin, such as: 1.Rheumatoid arthritis. It should be remembered that osteoarthrosis is often associated with rheumatoid arthritis. 2. 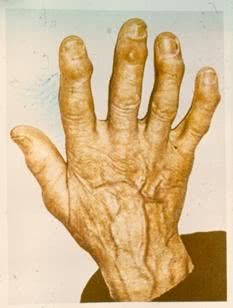 Gout. 3. Ankylosing spondylitis. 4. Diffuse hyperstosis. 5. 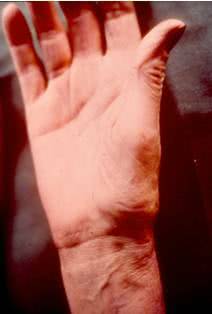 Rheumatic polyarthritis. Treatment of Osteoarthrosis. Treatment of osteoarthrosis must be complex and should be undertaken considering various aetiological and pathogenetic factors which can vary. Effectiveness of treatment depends on the stage of the disease. 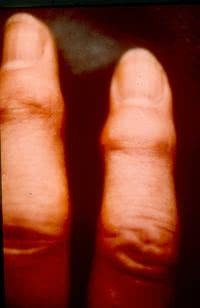 Presence or absence of reactive synovitis plays a major role in selection of treatment. The course of the disease and underlying diseases may be also relevant. 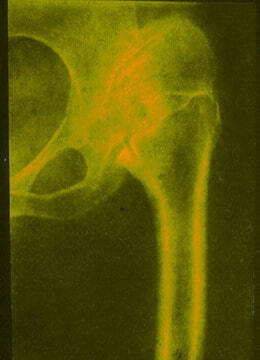 The main principle of treatment of osteoarthrosis which is often not observed is its duration and systematicity. 1. Control of disease progression. 2. Control of pain syndrome. 3. Control of inflammation. 4. Restoration of joint function. 5. 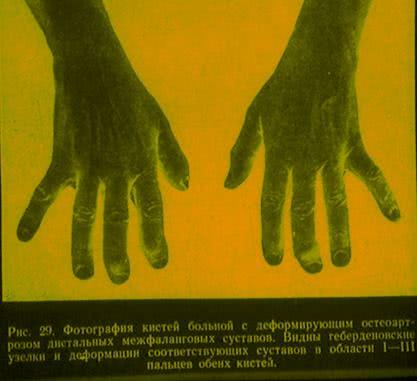 Decrease of the risk of involvement of other joints. 6. 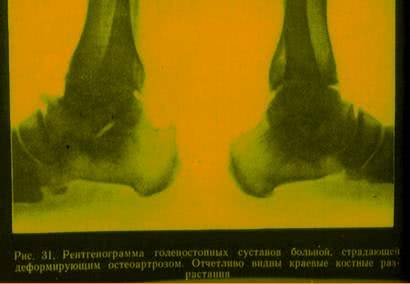 Treatment of primary disease, which initiated osteoarthrosis. 7. Improvement of the standard of living. 8. Prevention of complications. Management of osteoarthrosis depends on the severity of the disease. In mild osteoarthrosis the doctor should encourage and instruct the patient to avoid aggravating stress to the affected joint and prevent further injury. Sometimes patients may be prescribed analgesics to relieve pain. In severe osteoarthrosis, especially when the hip or knee joint is involved, a complex of nonpharmacologic interventions should be considered in addition to pharmacologic therapy, including analgesics and anti-inflammatory drugs. It is not allowed to walk for a long time. In osteoarthrosis of the knee or hip joint it is not allowed to stand, squat or to be on your knees for a long time. It is not allowed to carry weight. It is recommended to avoid being overweight. Excess weight increases the load on the joints. Occupational adjustments and joint unloading in certain joints may be necessary. Aerobic and muscle-strengthening exercises may be also beneficial. Special diets and complexes of physical exercises (aerobic and muscle-strengthening) also give relief to patients. Bandages or bracelets are typically applied to the knee, if ligaments are unstable. When the cervical part of the spine is involved, cervical collar can give pain relief to the patient. 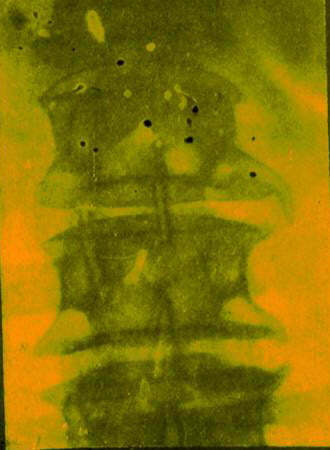 In lumber lordosis patients are advised to use lumber supports for pain alleviation. Joint unloading in certain joints (for example, knee, hip) by means of using a stick or going on crutches. II. Remedial exercises. 1) Joint stiffness and avoiding stress to the affected joint can lead to muscle atrophy. That is why, it is so important to instruct the patient to relax muscles of the back and muscles where myogenic [muscle] contractures occur. 2) The patient should have short periods of rest. However, joint disuse can cause muscle atrophy. Joint unloading should not be excessive, because it can cause atrophy of the articular cartilage. 3) Performing remedial exercises you should avoid aggravating stress to the affected joints. These exercises should be performed in a lying or sitting position. 4) Paraarticular muscles play a major role in protection of the articular cartilage. That is why, they should be strengthened by means of special exercises which also contribute to preservation of joint motion and function. In osteoarthrosis of the knee joint these exercises should be performed for a few weeks. They are considered as effective as taking nonsteroidal anti-inflammatory drugs (NSAIDs). Some patients proclaim relief with isometric contractions of muscles supporting the joint. In osteoarthrosis of the knee remedial exercises for the quadriceps may be beneficial. 5) Swimming may benefit patients with osteoarthrosis of the hip or knee. Running/jogging is not recommended. III. Physical therapy At an early stage of osteoarthrosis balneotherapy (including hydrogen sulfide, radon and iodide-bromine baths) has a favourable effect on cartilage metabolism, peripheral hemodynamics and microcirculation. In aggravation of osteoarthrosis associated with synovitis electromagnetic fields of high frequency, magnetotherapy and ultraviolet irradiation (erythema doses are typically administered) can be used. In moderate aggravation of osteoarthrosis microwaves of decimetre range (decimetre wave therapy – DMW therapy) and impulse current of low frequency are used. DMW-therapy has a well pronounced anti-inflammatory effect which is conditioned by its influence on microcirculation and inflammatory mediators. Administration of medications by means of ultrasound is beneficial in pain syndrome. Some patients find relief with electrophoresis and impulse current. 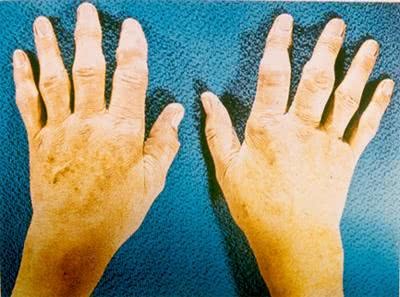 In remission the use of therapeutic muds, for example, silt and peat muds, as well as other sources of heat, such as paraffin and ozokerite (or mineral tallow) is effective. Inductothermy, microwaves of centimetre range, laser therapy, massage, mud therapy and transcutaneous electrical stimulation are approved for activation and stimulation of metabolism and microcirculation in tissues surrounding the affected joint. Laser therapy is highly effective in treatment of osteoarthrosis. It has an analgesic effect. It improves microcirculation and regenerative processes occurring in tissues surrounding the affected joint. It also has an anti-inflammatory effect. Massage may benefit patients in treating osteoarthrosis. The affected extremity or the spine are typically massaged. The affected joint should not be massaged. IV. Sanatorium-and-spa treatment Patients are recommended to go to Yevpatoria, Sochi, Zheleznovodsk, Pyatigorsk, Tshaltubo, Elton, Saki and Kemer which are considered to be the best mud cure, balneology and spa resorts. V. Surgical treatment Types of surgical intervention vary depending on localization, extent of deformity of a joint and disorder of the function of the affected extremity. 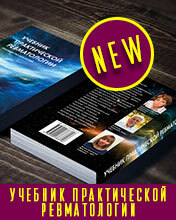 The age of the patient and concomitant diseases are also relevant. The following types of operations are typically performed: arthroplasty, osteotomy and arthrodesis. Endoprothesis [replacement] of a joint is undertaken at an advanced stage of the disease. Arthroscopic surgery can prevent the joint from getting locked [blocking] and contributes to pain alleviation. Prognosis. Long-term prognosis is quite favourable. The course of the disease is extremely variable.